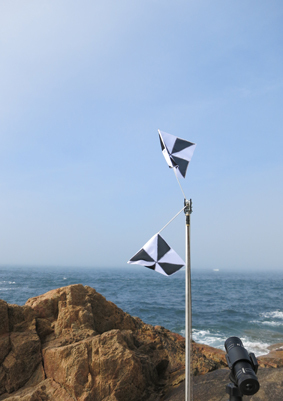 For their project „wig wag zig zag“ Beate Engl and Stefan Wischnewski built a vehicle with flags, which is able to spell letters as flag semaphores, a visual signal usually with hand-held flags. 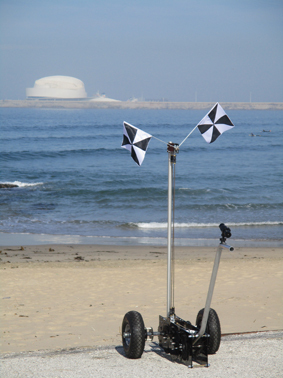 During the exhibition in Porto Engl and Wischnewski pulled and pushed the mobile sculpture along the coast. Thus the mechanism of the cart is spelling random letters with the moving flags and at the same time a small camera is documenting the whole performance. The flag semaphore was used in the maritime world since the 19th century for emergency communication in daylight.